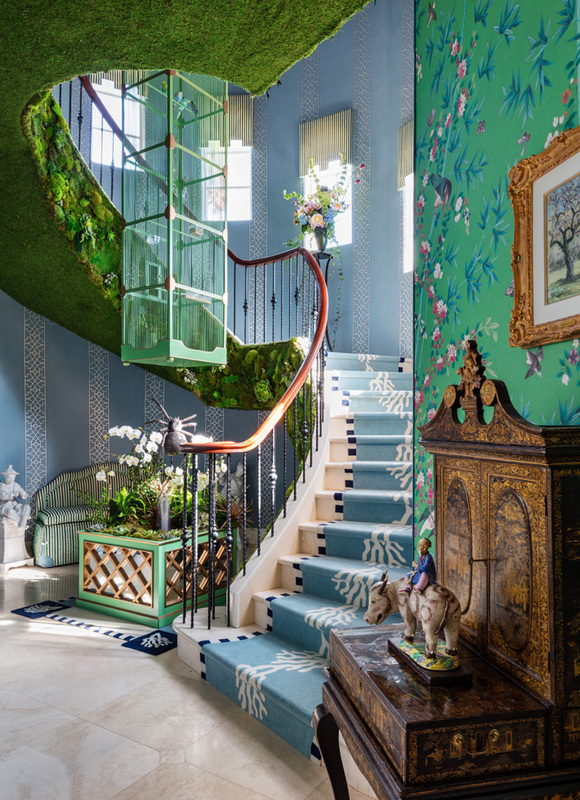 The Kips Bay Showhouse Palm Beach, the second annual Florida iteration of the esteemed Kips Bay Decorator Show House in New York City opens with a stunning display to benefit both Kips Bay Boys & Girls Club and Boys & Girls Clubs of Palm Beach County. Featuring 22 of the nation’s most prominent design firms, the Show House is open to the public through Wednesday, Feb. 20, 2019. 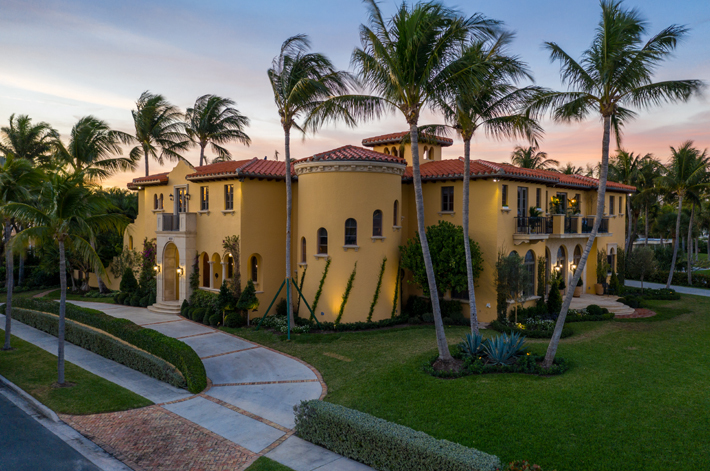 Located along the Intracoastal Waterway in West Palm Beach’s South of Southern neighborhood, the house is well worth a visit! 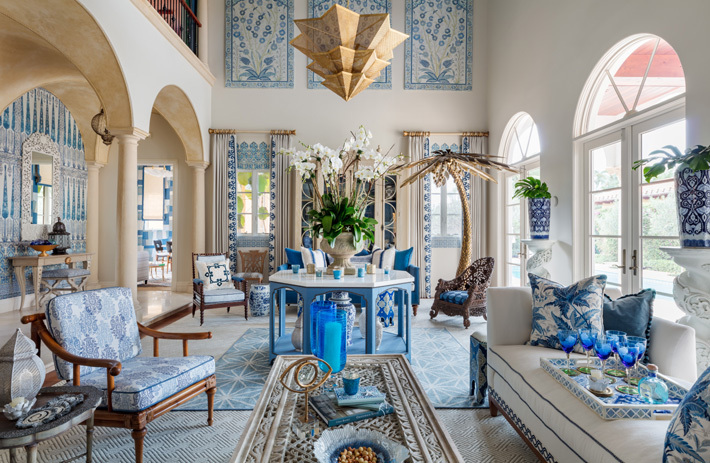 In just under four months, the group of talented designers transformed each room of the remarkable ​10,000 square-foot Mediterranean mansion. Design enthusiasts and novices alike will be inspired by the level of creativity and imagination on display. Unexpected wall treatments, beautiful furnishings and an array of bold colors await. 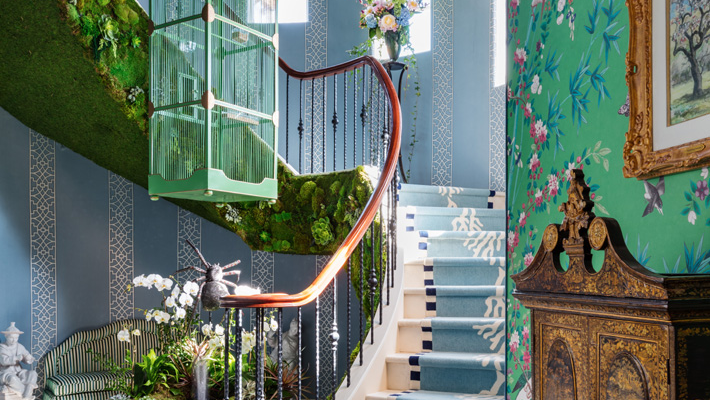 If you can’t make it to the Kips Bay Showhouse in person here is a tour in images! Exterior by Paradelo Burgess Design Studio & Lopez Group, Inc.
Palm Beach-based ​Andres Paradelo of Paradelo Burgess Design Studio ​in collaboration with Lake Worth-based​ Jobe Lopez of Lopez Group, Inc. ​worked to elevate the home’s curb appeal with a topiary garden, potted citrus plants, and jasmine along the exterior walls of the home. Tall hedges in the backyard create a formal garden and privatize the space. While newly planted olive trees line the pool and provide a subtle patio refresh that honors the home’s traditional Mediterranean architecture. Los Angeles-based​ Peter Dunham ​of​ Peter Dunham Design ​transformed the home’s first-floor guest suite. He created a cool and comfortable lounge with multiple seating areas for socializing. Aptly titled ​“Blue Paradise,”​ the room boasts a color scheme indicative of the Palm Beach shoreline. The walls are wrapped in blue and indigo fabric by Peter Dunham Textiles. Statement furnishings and accent pieces such as a wicker credenza, vintage cushions, and memorable art create a space that is approachable, yet rooted in sophistication. Grand Living Room by Rinfret, Ltd.
For the ​Grand Living Room​,​ ​Connecticut-based ​Cindy Rinfret​ of ​Rinfret, Ltd., created an intimate and inviting entertaining space. The space is inspired by the natural hues of the sky and the Florida coast. An intimate lounge space with a side bar behind antique Moroccan arches opens to intimate seating areas. Patterned wallcoverings, a painted ceiling with decoupaged fabric trim, and engaging details layered everywhere provide a fresh take on the home’s original architecture. The home’s ​Powder Room​ was designed at the hands of​ Mark Williams and Niki Papadopoulos. The Atlanta-based team at​ Mark Williams Design Associates infused a sultry contemporary vibe into the space with a metallic wallcovering mural, gilded and glass tile, brass details in the Kohler plumbing features and wall sconces, a velvet Relaxed Roman Shade by The Shade Store, and a black silk wall covering on the ceiling. suspended from a tented ceiling. New York-based​ David Scott ​of​ David Scott Interiors ​expresses his take on the​ Dining Room ​by having it play home to a mix of fine antiques, contemporary furnishings, ceramics by today’s great artisans, and eye catching art. 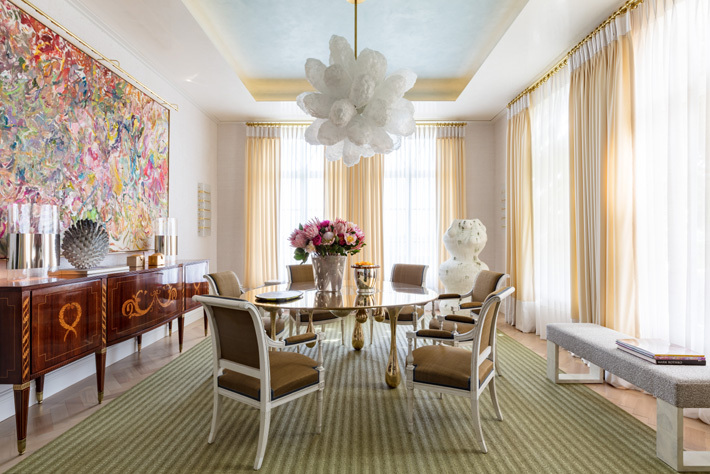 At the center, a hand-blown chandelier replicating coral clusters of the ocean hangs above a polished bronze dining table with antique chairs. 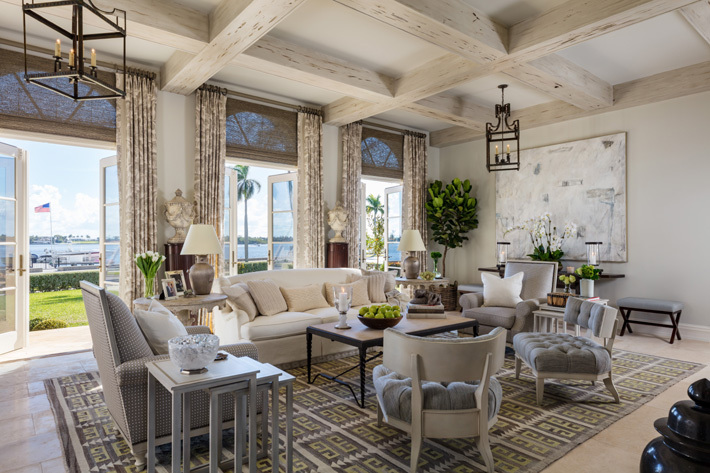 Floor-to-ceiling window treatments by The Shade Store make way for sweeping views of the Intracoastal Waterway, offering a relaxed feel to the entire space. A comfortable, calm space to relax and enjoy time spent together was the inspiration behind Los Angeles-based ​David Phoenix​ of ​David Phoenix Interior Design’s​ family room. Built on a neutral color palette with subtle pops of blue and green, the room boasts stunning views of the water, outdoor loggia and pool deck. Portuguese limestone floors and white walls modernize the space and allowed for a beautiful Chesneys Fireside mantel to take center stage. Connecticut-based ​Lee Ann Thornton​ of ​Lee Ann Thornton Interiors ​offers a chic and intimate gathering place she’s coined, ​“The Little Club.”​ Inspired by the Bahama’s famed Lyford Cay and its charming little club, the room is a take on tropical sensibility with rich pops of turquoise and raspberry, wicker lighting, a Waterfall Woven Wood Shade by The Shade Store, and a natural seagrass rug. Two long settees offering ample seating coupled with a well-appointed bar situated within a built-in bookcase creates the perfect atmosphere for lively conversation over cocktails. 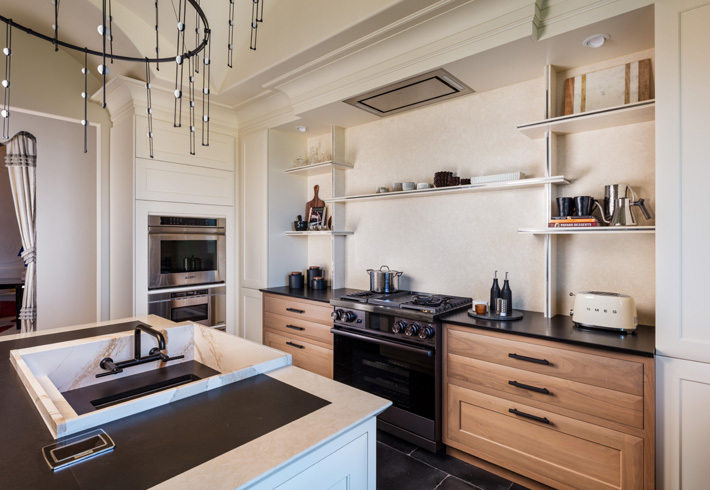 Classic warmth and clean lines of both modern and traditional styles are captured in the kitchen from New-York based ​Vasi Ypsilantis​ of ​Vasi Ypsilantis Design Associates​. ​“The Modern-Day Traditional Kitchen”​ is anchored by a Dacor range and features a walk-in pantry, an oversized sink and KOHLER wall-mount Purist faucet in matte black, beautiful matte Cambria countertops that are reminiscent of traditional kitchen design, and a spacious island for entertaining. The neutral color palette is infused with both vintage and modern style elements, offering a unique look that transcends time and trends. An ode to the modern woman. New York City-based ​Jessica Schuster​ of ​Jessica Schuster Design ​transformed the ​Breakfast Room​ into an ornate, luxe space. Designed as a place where the lady of the house can escape to focus on herself and her ambitions. 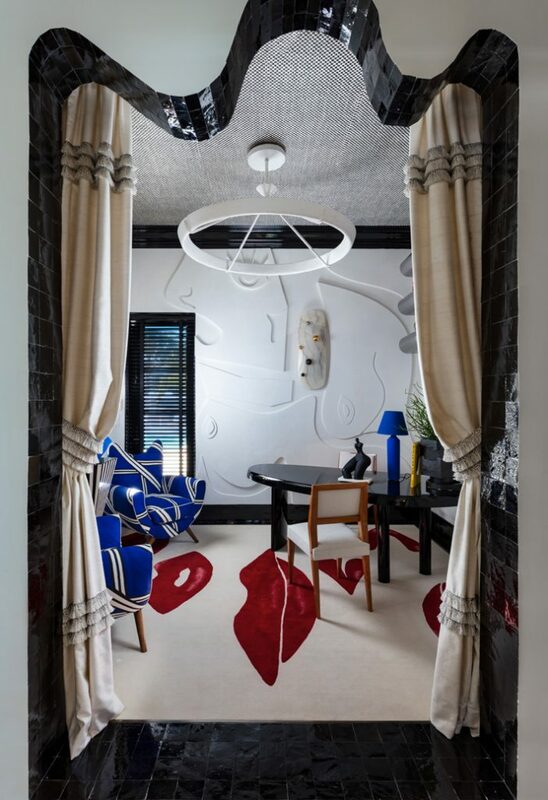 The room boasts a custom wool and silk carpet by Crosby Street Studios featuring a custom design of lips and hearts. While the ceiling features a checkerboard pattern with a mother of pearl inlay. A mix of modern and vintage light fixtures and large-scale modern art bring a touch of sensuality to this fun, inspiring space. 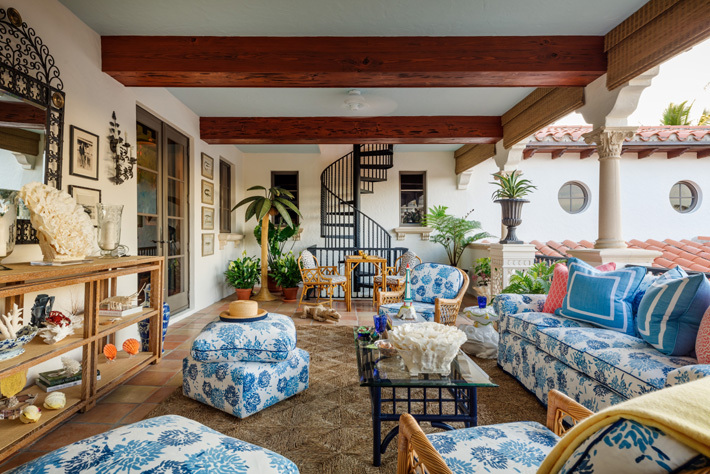 Designed by ​Leanne Yarn​ of ​Yarn Design Associates​ in Boca Raton, the ​Den ​is a refreshing hideaway with multiple seating areas to relax after a long day. Upon entering the space, lacquered bookcases embellished with polished coconut shells serve as the focal point, stretching across an entire wall and housing a number of books and small sculptural pieces. The color palette is delicate powder blues and soft whites with pops of citrine and silver that celebrate the room’s water views. The Stair Hall ​and​ Corridors ​are the core of the home, which is why Connecticut-based Billy Ceglia ​of ​Billy Ceglia Designs ​approached his design with family in mind. Connecting the kitchen, back staircase, and mudhall is a green lacquered Madagascar Cloth ​“Honor Bar”​ — a cozy nook filled with treats, both visual and edible, for every member of the family. 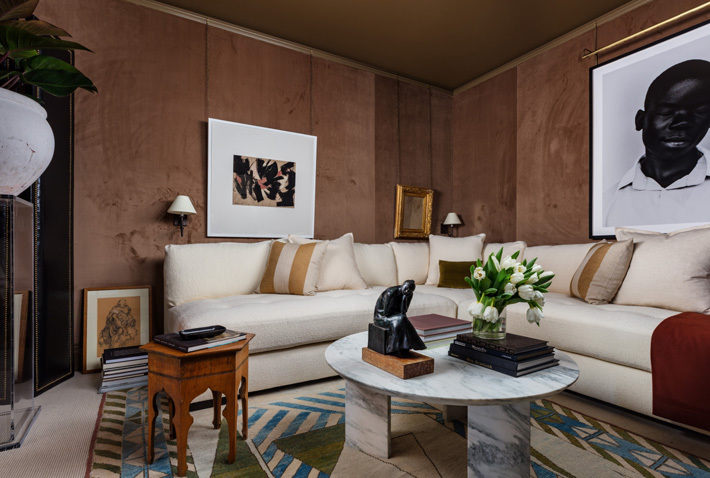 An ultrasuede white fabric lines the walls of the mud hall, stair hall and upper landing where an intimate lounge area sits complete with a custom stripe carpet, tailored sofa, and ​étagère which houses books, family treasures and vintage decor. An oversized ​Storage Closet​ was transformed into a catch-all space for the necessities of everyday life. While the ​Cabana Bath​ invokes practical luxury with porcelain faux wood tile and Kohler plumbing features. The ​Outdoor Loggia​ and pool deck designed by​ California-based​ Amy Meier Design ​invites guests to lounge outside. 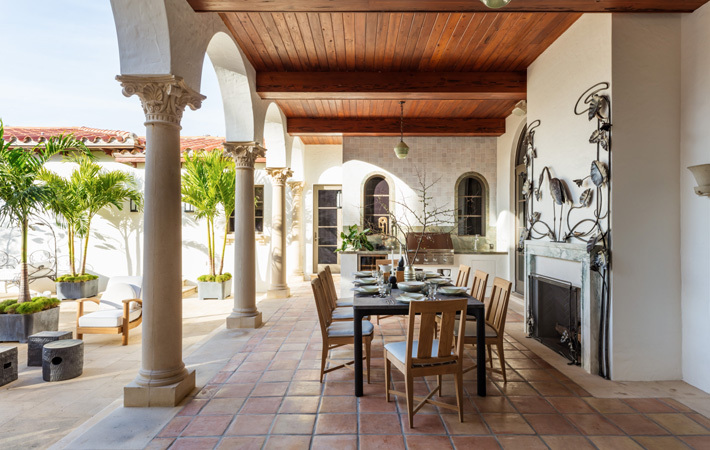 The space is filled with highly stylized outdoor furniture, umbrellas, and standout sculptural pieces by David DeSantis that replicate Palm Beach’s art nouveau period while also paying homage to the home’s Mediterranean architecture. A Chesneys Fireside fireplace and a chic outdoor kitchen complete with Dacor appliances and Kohler fixtures create the ideal space for outdoor entertaining. Bold colors and Moroccan influences reign supreme in Palm Beach-based​ Jennifer Garrigues Interior Design’s “Exotic Retreat.” ​The guest bedroom embraces eccentricity with striking high-gloss turquoise walls by Benjamin Moore and saturated accents of citrus green, peacock blue and purple throughout. Eye-catching details and trinkets from around the world adorn the space, showcasing the quarters of a life well-traveled. 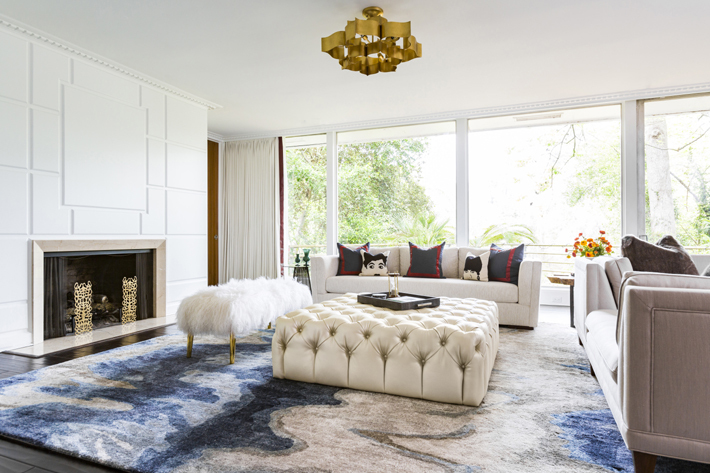 The cozy ​“Sunset Tower Suite”​ by Atlanta-based ​Danielle Rollins Interiors ​invokes the 1970s era of glamour in style and design with flattering tones of coral, pinks and apricots. The room is curtained in a luscious primrose colored cotton sateen. A wrought iron faux bamboo canopy with an upholstered pagoda inspired top and billowing curtains anchor the space, creating a private retreat. The guest bathroom received a refresh with classic KOHLER ​[LA1] ​Pinstripe faucets on a vanity clad in Cambria surfacing. The signature transitional style of Nashville-based​ Jason Arnold ​of​ Jason Arnold Interiors ​informed the design of the ​“Upstairs Lounge”. An ideal retreat from a day spent in the Palm Beach sun. A rich and moody wallcovering by Phillip Jeffries canvases the walls. While a variety of textures and a cozy ivory sectional work together to create an inviting place to relax. An antique mirror, rug, and armchair upholstered in black leather juxtapose a strong, high-contrast print by lauded contemporary photographer Bastiaan Woudt to complete the room. 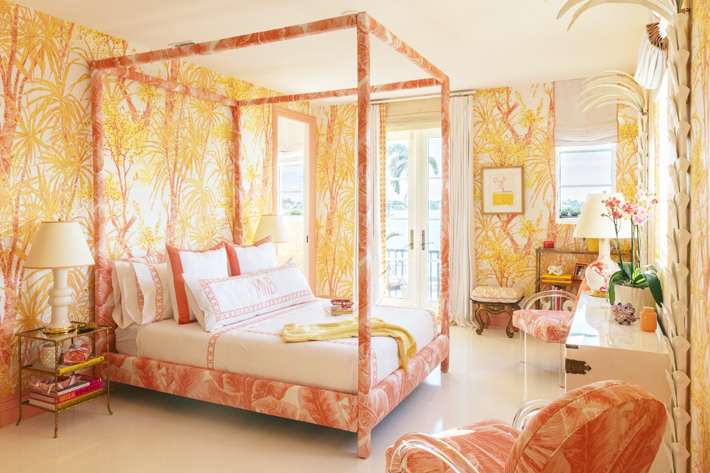 The ochre and terracotta tones of the Mediterranean style Fountain House inspired the bright and gregarious Palm Beach hues of Connecticut-based ​Meg Braff​ of ​Meg Braff Designs’ “Sunrise Jungle” ​guest bedroom.​ ​Braff’s own “Rainforest” wallpaper covers the walls with whimsy. While a custom-built parsons bed anchors the space and brass nightstands add a touch of mid-century glamour. 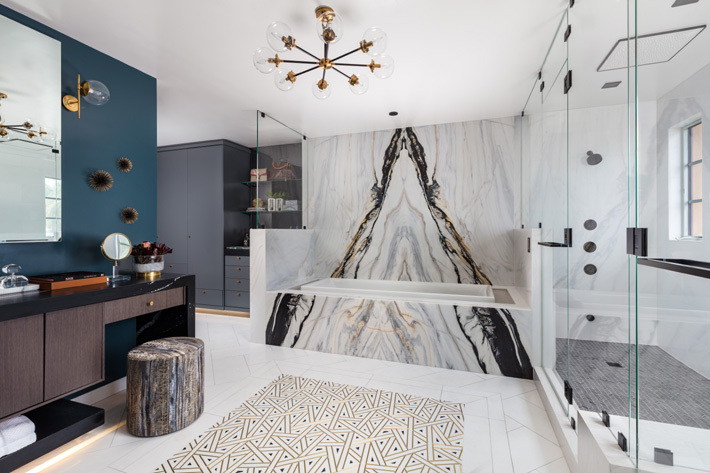 Cambria surfacing, a statuesque lavatory sink with brass legs and Purist faucet, both from Kohler, take center stage in the bathroom, which also received a glamorous update. chrysanthemum pattern ​by Leslie and D.D. Tillet, lush plantings, and ornate objects add a whimsical and unexpected dose of charm. Mitchell Brown’s ​signature design approach is to reflect the source of what brings his clients comfort. 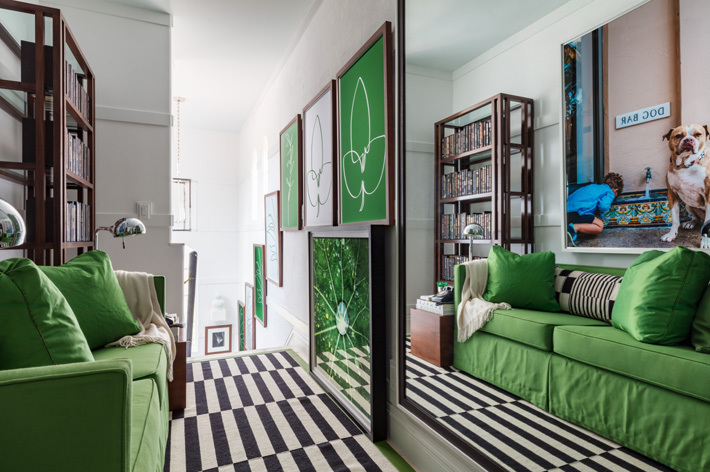 The Palm Beach-based designer did just that in the ​Kips Bay Showhouse Master Bedroom. The space beautifully serves as a peaceful evening respite and a place one finds energy to start the day. An upholstered L-shaped banquette creates a warm and cozy seating area. While a shimmery de Gournay wall covering, luxurious bed linens, and statement furnishings like a lucite desk and mirrored cocktail table round out the elegant space with a modern twist. The ​Master Bathroom​, nicknamed ​“le bubble lounj,”​ features the design savvy of Palm Beach Gardens-based ​Krista Watterworth Alterman ​of​ Krista + Home. 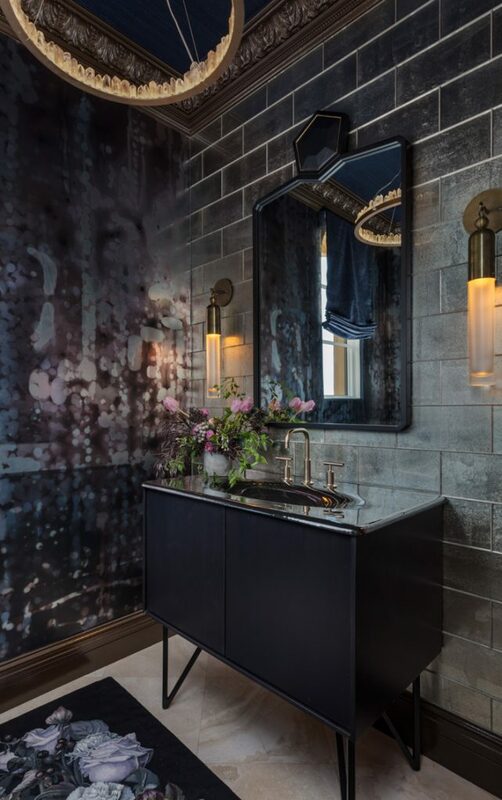 ​Creating a sensual, upscale lounge to celebrate, connect and relax, the space juxtaposes a sultry jet-black palette with pops of nickel, ocean, drift, sand, mist, brass and cloud. The innovative, contemporary space builds visual interest through the transparent shower and bathroom walls. The room showcases the very best in Kohler bathing technology for a truly luxurious experience: A digital showering system complete with a Real Rain showerhead, a Sok infinity tub encompassed by book-matched Ceramic Matrix marble slabs, and reflective surfaces with rich smoldering finishes. The custom master closet features closed cabinets that offer a sleek look while providing function. 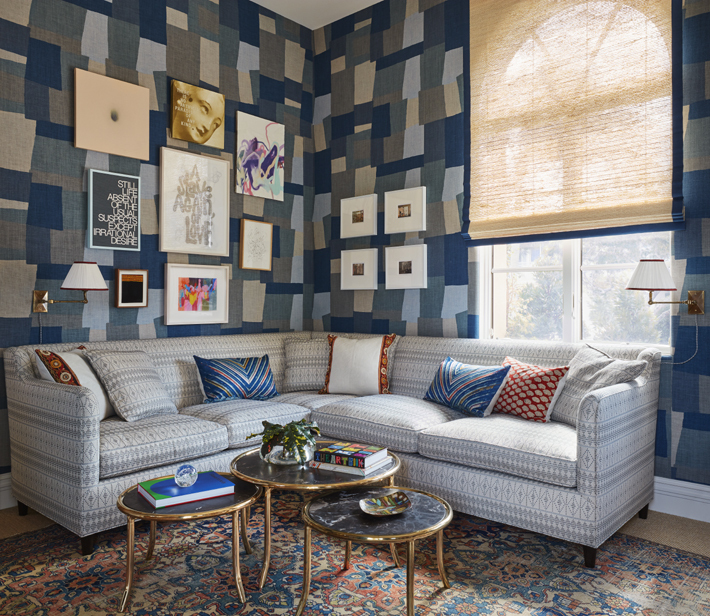 Many of the products and treatments in the Kips Bay Showhouse home are courtesy of Benjamin Moore Paints, Kohler Co., and The Shade Store — the Kips Bay Decorator Show House Palm Beach’s exclusive sponsors. Additional Kips Bay showhouse sponsors that provided products or support include: The Rug Company; Cambria; VERANDA; Eau Palm Beach Resort & Spa; Aston Martin Palm Beach; David Sutherland, Inc.; Ceramic Matrix; Dacor; New York Design Center; Morgan Stanley Wealth Management; Currey and Company; Caroline Rafferty Interiors; Chesneys Fireside; Fabricut; Marmi; Sean Rush Atelier; The Royal Poinciana Plaza and Susan’s Jewelry. Proceeds from the Kips Bay Showhouse Palm Beach benefit Kips Bay Boys & Girls Club and Boys & Girls Clubs of Palm Beach County. 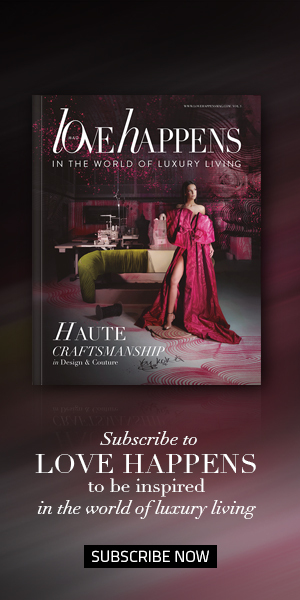 For tickets to the Kips Bay Showhouse Palm Beach visit: www.kipsbaydecoratorshowhouse.org/palmbeach​. Tickets are also available at the door during general admission hours. For more information, call 718-893-8600 ext. 11236. As you might expect, the outdoor areas at the Kips Bay Decorator Show House Palm Beach reflect the tastes and fancy of their designers. But they also reflect a collaborative effort among several of the participating firms. Those are some of the best interior designs for sure.